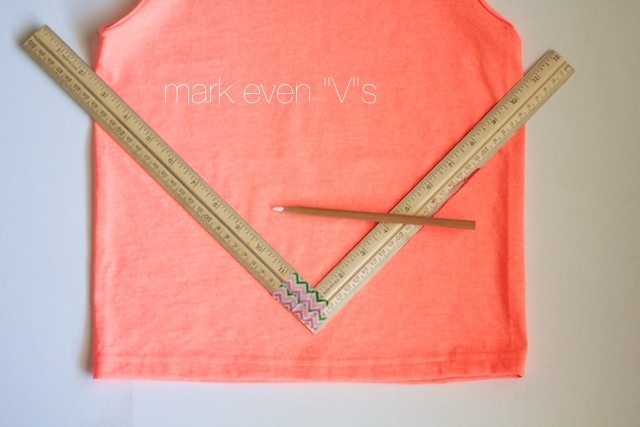 DIY Leather Accent "V" Shirt! You might think that this blog post is about a shirt. It's about a glorious and monumental time in a six year old's life. Because after two years of begging, Paige has finally gotten her first skateboard. 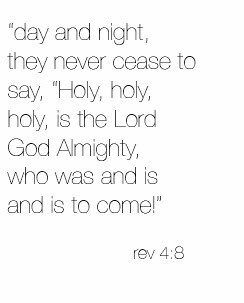 Let the heavens rejoice! Her dream (and Daddy's nightmare) has come true at last! And, so, we made a shirt to wear while she uses it. Because duh. We make things. Mark your V's. The easiest way is to tape two 12'' rulers together as pictured. Then mark to the same number on each side. Use a fabric pen or chalk pencil that will rub/wash out later. 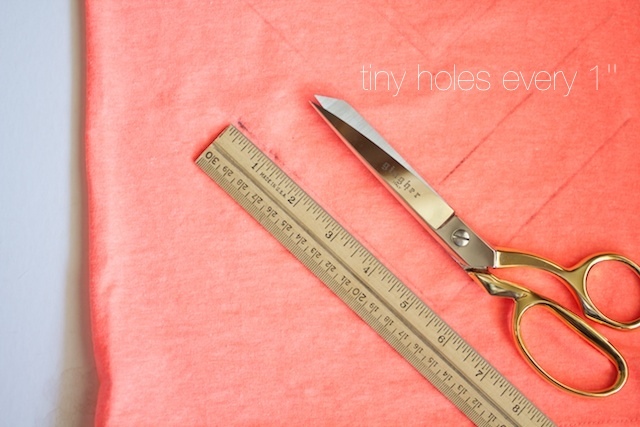 Then use the ruler again to make two tiny holes about 1/4'' apart with about 1'' between each set of holes. 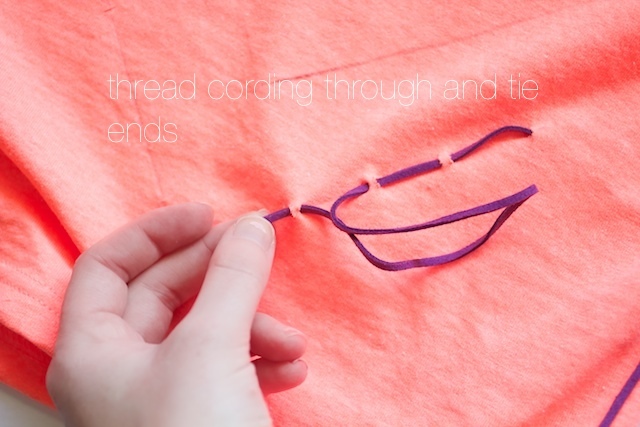 Start and end your hole at the ends of each V. You want to hole to be smaller than your cording so the fabric stretches when you thread it through. Knot one end of the cording and thread through the V, knotting at the other end as well. Whether or not you want the knots inside or out doesn't matter, Paige isn't a picky child when it comes to comfort, so I started with the knots on the inside. Switch to a different color of cording for each V.
So ever since Paige was a baby, I promised myself that I would watch her as she got older to see what she was passionate about so I could encourage her in it. Of course we all live through our kids a little here and there, and she really does enjoy Paige Crafts, but it's not her passion like it is mine. So what has she really shown interest in? Well, horses (not zoned for that), ballet (not rich enough for that) and...skateboarding. Uhhh, skateboarding? Wha?? "NO way. She's gonna break her arm!" That was my husband's firm stance for quite a long time. But sooner or later, dimples get what dimples want. So now she and I go to the skate park every morning, and you know what? I love it! We've been studying up a little and watching sweet skateboarding videos on youtube, and I'm kind of falling in love with it all. I love how skateboarders seem like they're so cool and rebellious, but then they name their tricks things like "ollies" and "fakies" and "pop shove its" could that be any more precious?? It sounds like we're playing Pokemon! Watching her out there on the ramps is my new favorite thing. She's so bold! The first time out there she was all over the place and completely fearless. I love that about her. I can tell she also feels really James Dean on her board, which is so adorable. She's all duck lips and thumbs ups and "yeah, baby! "s in her pink panda helmet. And I'm sure this has nothing to do with her skateboard obsession (wink, wink) but she has a little crush on our friend at church who is an amazing skateboarder. So cute. 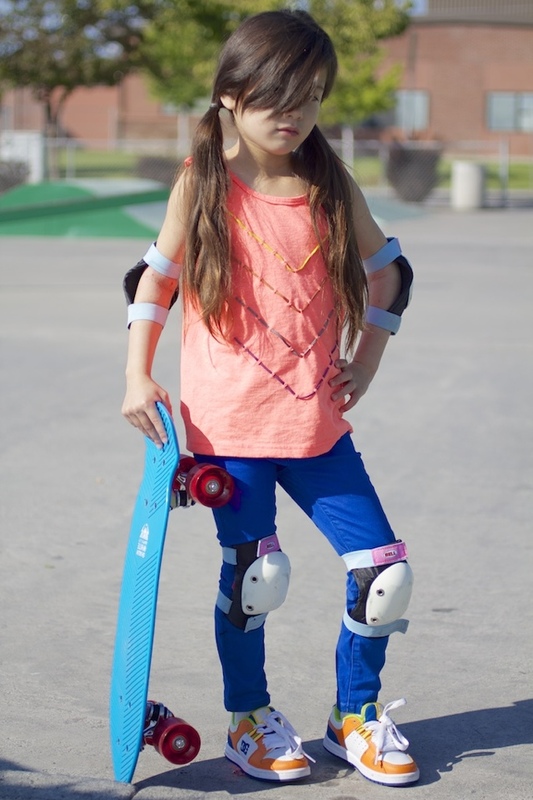 She's always saying "I'm going to go do some tricks, like Todd." or "Todd would probably like this. "I die laughing inside every time. I love this little girl. Have a great almost weekend! I am getting ready to head out of town for a couple of days with two of my lady-friends and I'm so excited about that. Yay for the weekend! That is too, too cute. I love that you're going with what her interests are. This is the cutest photo shoot of all time. 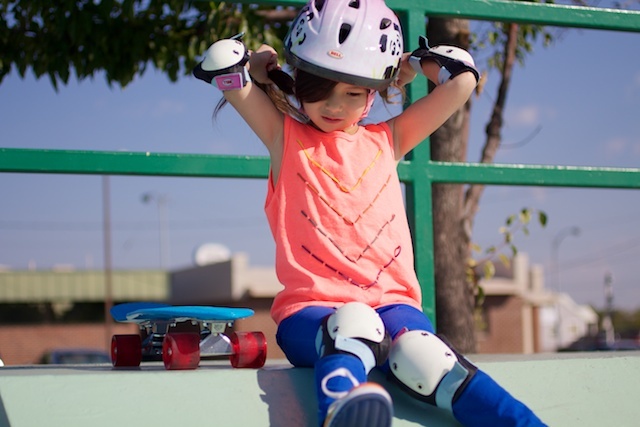 Skater girls rock, and that little shirt is gorgeous. Love the shirt. I love her look on the skateboard especially those shoes are super cool. Enjoy your few days away with friends. Hi Disney-glad to see Paige is wearing protective gear! 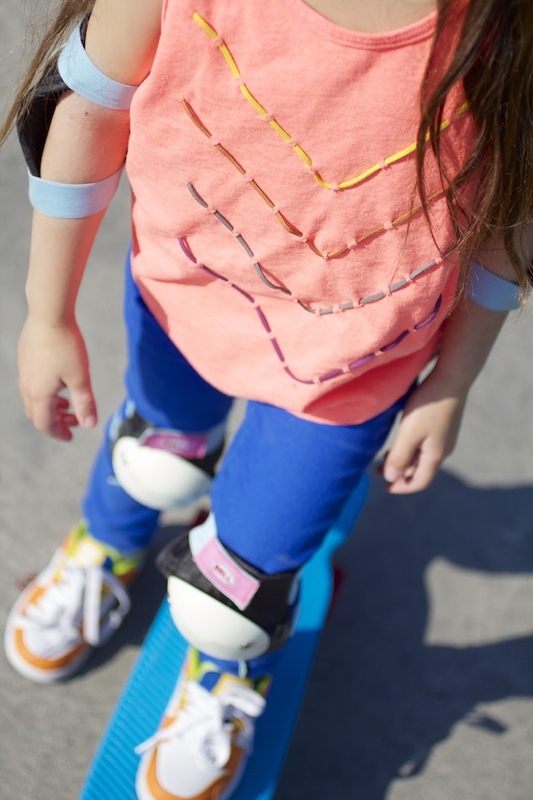 My sons,6&4, have also recently fallen in love with skateboarding, and I picked up some awesome wrist guards at Walmart! Have fun with it!!! 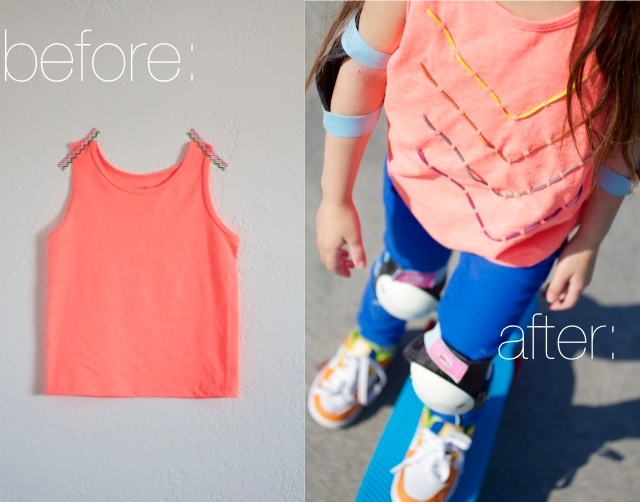 The shirt is gorgeous but the little skater dudette...even more so. She is FANTASTIC!!! 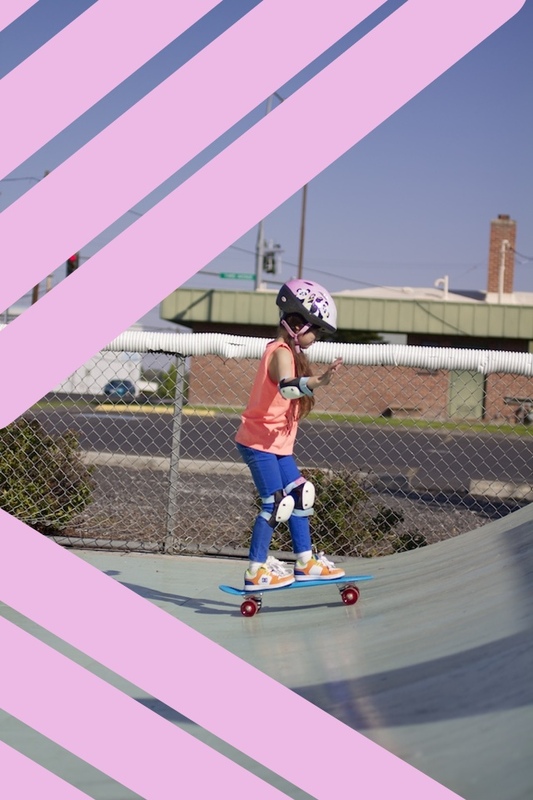 There's a great organization in Seattle called Skate Like A Girl http://skatelikeagirl.com/ Paige looking so cool reminds me of that. Go girl! I've heard of that! That would be so fun! So cute! Love this shirt, might have to do something similar to one of mine! She is so adorable in that photo with her fringe over her eyes and the little pose!! I love it, so gorgeous! Its nice to see a little one with such confidence, wish I had that kind of confidence when I was her age!! This is great and easy. Love this DIY. Your daughter is so cool. My 7-yo a little skater girl, and I'm so proud. 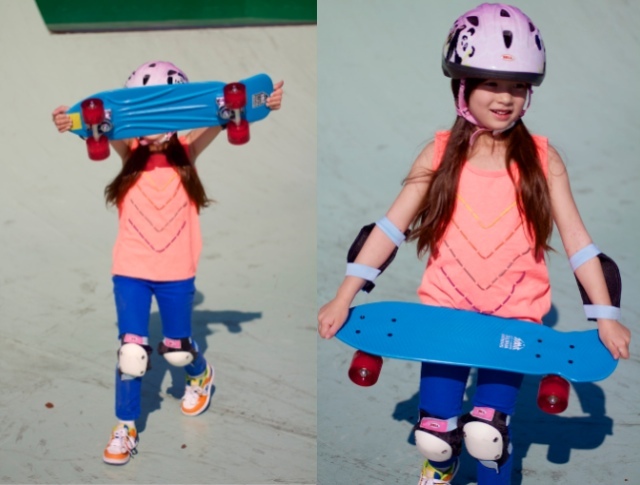 I didn't even stand of a skateboard until I was 19, and she's way better than me already. Oh that's so cute! Love the shirt! 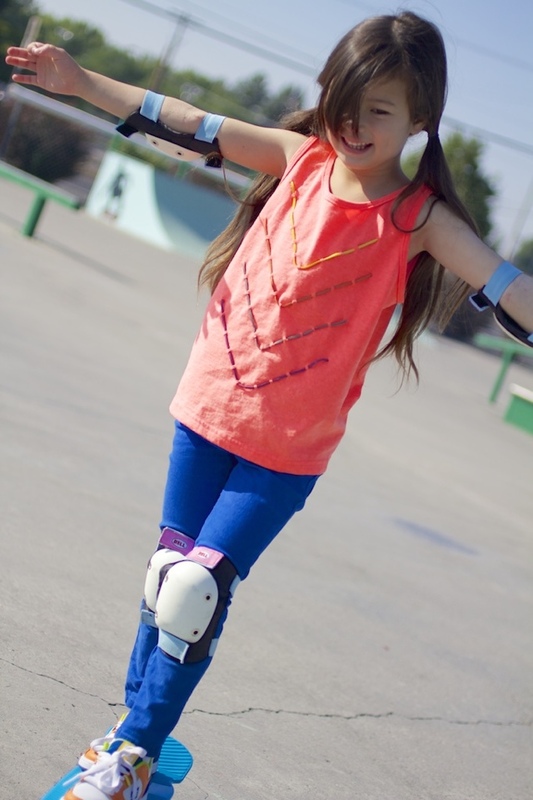 Your little skater girl is amazing! This one is a fail for me. Looks very cheap! Your daughter looks adorable as always, though. :) Thank you!! I sure think she does. So glad that Paige's eczema is better. I have a pair of girl twins having eczema and outgrowing it after their one and half year old. I can still feel my worries back then. Hope that Paige will outgrow it sooner.